In the past several days, Russian Foreign Minister Sergei Lavrov and the first deputy defense minister and chief of the General Staff, General Valery Gerasimov, went on an unprecedented joint trip to Israel, Germany and France to promote a new plan to rebuild Syria and to begin a mass return of refugees. In Israel, Lavrov and Gerasimov met with Prime Minister Benjamin Netanyahu; in Berlin, they spoke with Chancellor Angela Merkel; and in Paris they sat down with President Emmanuel Macron. In Berlin and Paris, the talks apparently covered Ukraine in addition to Syria. Gerasimov is under European Union sanctions for his role in the Ukrainian crisis and is officially banned from visiting Europe, which evidently did not impede his visit or talks (Militarynews.ru, July 24). The Russian military intervened in Syria in September 2015. Massive bombing campaigns by the Russian Aerospace Forces (Vozdushno-Kosmicheskiye Sily—VKS) and President Bashar al-Assad’s Syrian Arab Air Force (refurnished and reinvigorated with Russian help) as well as the massive deployment of Iranian ground troops and pro-Iranian militias have slowly but steadily ground down the Syrian opposition as an effective fighting force. The course of the war was turned, and the fractured opposition, which in 2015 controlled more than half of the country, is now confined to a dwindling number of pockets of resistance. Its days look to be numbered. The Syrian Arab Army (SAA) and other pro-al-Assad forces are currently taking over Daraa and Quneitra provinces, in southwestern Syria, close to Jordan and Israel. The “de-confliction zone” in the southwest (guaranteed by Russia, the United States and Jordan) has been effectively wiped out. Rebels are either outright surrendering or agreeing to be bussed, together with families, to Idlib province, after relinquishing heavy weapons. Only diehard Islamist radicals from the Islamic State and its affiliates seem to still be fighting a hopeless battle in Daraa and Quneitra (Militarynews.ru, July 26). Beyond those areas, the last significant opposition stronghold left is in northwestern Idlib province. Another area outside of Damascus’ control is the relatively large Kurdish enclave in the northeast, known as Rojava or the Democratic Federation of Northern Syria. Rojava is officially not a “de-confliction zone” since the leftist secular Kurdish leaders are locked in a conflict with the Islamic State and with Turkish leader Recep Tayyip Erdoğan. The Kudish fighters have mostly maintained neutrality with pro-al-Assad forces. But there are problems to sort out between Damascus and the Kurds on how to share Syria’s oil and natural gas wealth. Moreover, there are a couple thousand US and allied soldiers embedded with the Kurds in Rojava to help fight leftover pockets of Islamic State resistance. Still, the Kurds will most likely accept President al-Assad as a restored supreme leader in Damascus, if they are given broad autonomy rights and a guarantee they will not be attacked by Erdoğan, who brands them terrorists. According to sources in Moscow, the final battle to cleanse the Syrian opposition from the Idlib “de-confliction zone” may commence in September 2018 (RBC, July 24). The Syrian civil war, which has been raging since 2011, finally looks to be winding down militarily. But Moscow’s goals in Syria are broader: securing a stable and friendly, internationally recognized regime that will guarantee a permanent Russian military presence there—a naval base in Tartus and an airbase in Hmeimim—from which it will be able to project naval and air power into the Mediterranean. Consequently, devastated Syria must be rebuilt into a stable self-sustaining state; but neither Russia nor Iran have the money to do that. At the Russian-US summit in Helsinki, President Vladimir Putin apparently agreed with President Donald Trump that both Moscow and Washington must work together on restoring peace in Syria, according to US Secretary of State Michael Pompeo (Militarynews.ru, July 26). Lavrov and Gerasimov’s trip sought to sell the Israelis, the French and the Germans on the idea that retaining al-Assad in Syria is the best option and that massive aid donations could help stop the outflow of more refugees and begin a process of some of them returning. A stabilized Syria could give other countries the legal pretext to reject new refugees and actually repatriate some of those they already have. If Trump, Merkel and Macron agree to contribute money to rebuild Syria under al-Assad, oil-rich Gulf Arab states might also decide to help. The Russian defense ministry is dangling the prospect of the return of hundreds of thousands of Syrian refugees home, tempting European leaders to accept a Russian victory in the Syrian campaign (Kommersant, July 25). For Israel, on the other hand, keeping al-Assad in power and the Russians retaining their military bases has been always an acceptable outcome. What Israel wants in return is the removal of Iranian and pro-Iranian forces and long-range weapons from Syria. The US and the Gulf Arab states apparently want the same. Moscow is now attempting to perform a delicate balancing act by keeping the Israelis, Americans and the Arabs satisfied and agreeing to begin to invest into rebuilding al-Assad’s Syria, while not overly straining its relations with Tehran (see EDM, July 18). Up to 100,000 Iranian and pro-Iranian fighters are operating in Syria, according to Russian sources. Lavrov and Gerasimov reportedly offered Netanyahu and his military commanders an Iranian-free zone of up to 100 kilometers from forward Israeli positions on the Golan Heights. But this may not be enough for the Israelis, who want the Iranians completely out of Syria (Kommersant, July 24). On July 25, the Israel Defense Forces (IDF) hit targets in Quneitra province. This was praised by Russian military command, which alleged that Islamic State fighters had deliberately fired on IDF positions in the Golan Heights to provoke a confrontation, but the IDF precisely destroyed the Islamic State positions, “killing terrorists” (Militarynews.ru, July 26). 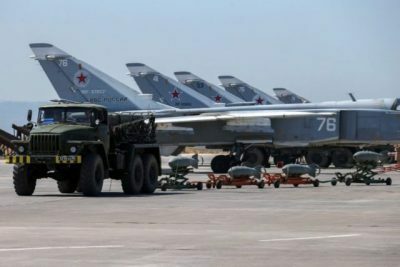 Reportedly, Russia has organized several meetings of SAA and IDF officials in the Golan Heights (Militarynews.ru, July 24). At the same time, the Russian defense ministry has accused US military commanders of undermining Trump’s authority by refusing to cooperate more closely with Russian counterparts after the Helsinki summit (Militarynews.ru, July 24). Russia cannot force Iran to fully withdraw from Syria, but it can continue to tacitly allow the IDF to attack and harass the Iranians. At the same time, Moscow is trying to sell the West on the need to begin rebuilding Syria to help solve the refugee problem, and it is pressing the US military to cooperate “in the spirit of Helsinki.” It is a gamble. But it could work.